Knowing how to build your own Kontakt instrument is a skill that many producers and engineers desire but knowing where to start is as difficult as learning a new language. Kontakt instruments may be complex in nature but building your own Kontakt library can seem far more simplified if you follow a step by step process designed for ease of use. 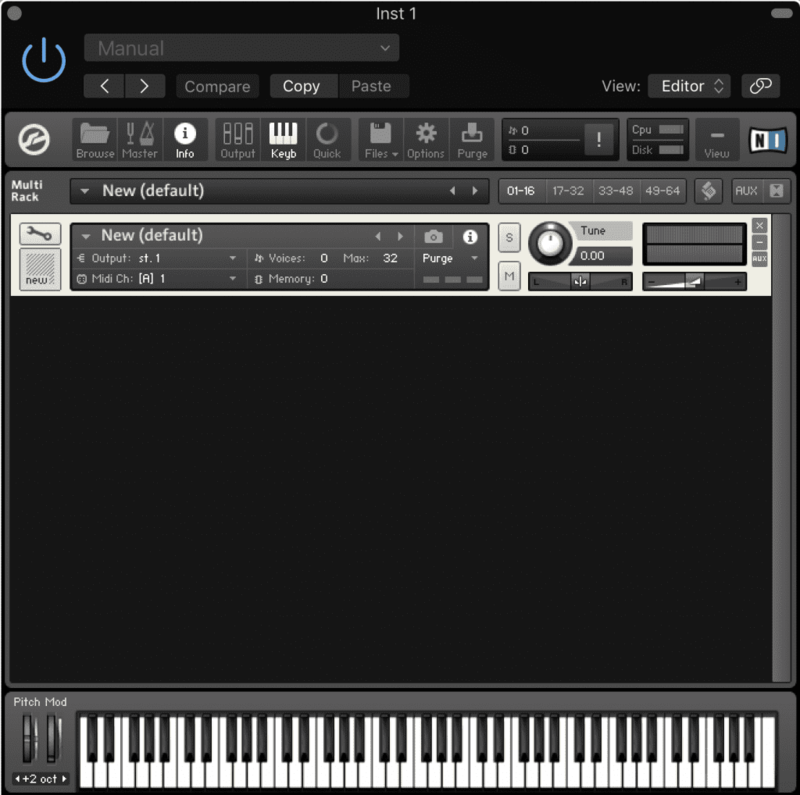 Open up Kontakt in standalone mode and then double-click to create an instrument, or simply drag and drop your chosen sample into Kontakt from your desktop or the Kontakt browser. Alternatively, you can head up to Files and Click new instrument. Now click on the wrench icon to enter rack instrument edit mode. Now we’ll begin adding samples and building up our instrument, to add samples head over to the Mapping Editor and then navigate to your samples via the Kontakt browser or alternatively you can drag and drop your samples into the Zone Grid of the Mapping Editor from anywhere on your computer. When you have your samples in your grasp dragging them over the Zone Grid without releasing will enable a highlighted region to appear showing you where on the keyboard your sample will be automatically placed once you release. Once you have released your mouse the Zone will have been created! Doing this to quick can be a little bit tedious and sometimes the results can be a little shoddy if you jump in head first without thinking. Here is how to drag and drop samples to avoid any frustrations. Simply dragging and dropping a single sample into the zone grid will take that sound and map it out across a large portion of the key range! If you’re creating an instrument this is something you’ll want to avoid. Doing exactly that is however relatively simple, When you have a hold of your samples dragging your mouse to the bottom of the grid will create Zones on a single key, Drag your mouse gradually upward and the key range will expand. If you want to import multiple samples as once, do so using the same method, If your mouse position is at the top of the grid, samples will map in overlapping zones and most likely sound like shite. *Quick Note – The sort order of samples when dragging multiple at once will determine where they are placed in the zones. 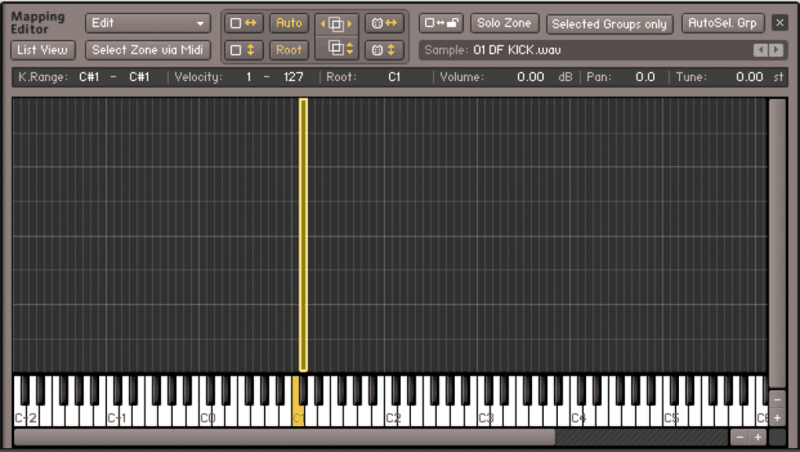 After your zones are created, you can change the root note by selecting its zone and dragging the highlighted key to its desired root note. Now that we have created our songs by default they will all be in the same group by default, Our next step is to separate our newly created zones into separate groups. To begin, click on the Group Editor in the Mapping Editor, for ease let’s assign one zone per group, In the Mapping Editor, select Edit>Move Zone(s) to New Empty Group. Repeat this process for the remaining Zones. Now disable ‘Edit All Groups’ in the group editor to prevent accidental parameter changes. Now it’s time to make this interesting and add some effects. In the Group Insert Effects, Click the + next to Add Fx and choose between Filters, EQ’s or other modulation effects, for this example let use a filter and adjust some parameters. 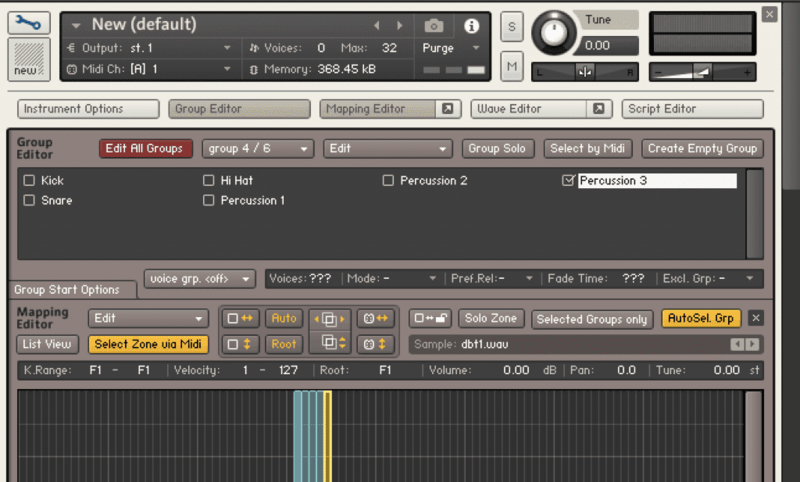 The Group Insert Fx and the Instrument Insert Fx in Kontakt are processed in the order in which they are placed in the chain, left to right. It’s also possible to save these as presets. 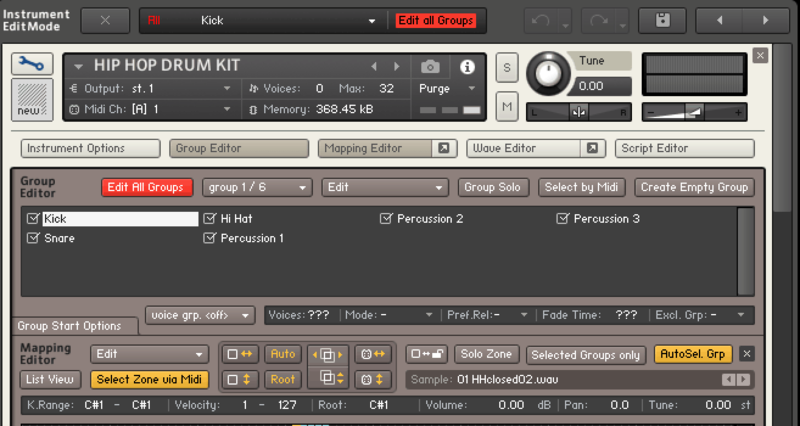 First, click the output name in the instrument header to open a drop-down menu with all of your defined output channels. Choose whichever one you like. Click the midi port name in the instrument header to open a drop-down menu will all of the available Midi Ports/Channels. Choose a port/channel that you would like the instrument to respond to incoming Midi. Kontakt supports four Midi Ports (A-D), each having 16 channels. 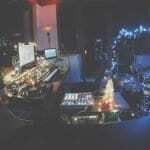 Kontakt also supports ‘Omni’. Choose ‘Omni’ if you would like the instrument to respond to any Midi Port or channel. And that is how you can create your own Kontakt instruments in 6 steps, We hope you find this method useful, Kontakt is capable of far more than what we’ve shown you here, Later we will be touching the advanced capabilities of Kontakt and exploring advanced features in intimate details.